These three views of Saturn were recorded by the Hubble Space Telescope on March 7th of this year, as the southern hemisphere of the solar system's most gorgeous planet reached its maximum 27 degree tilt toward Earth. 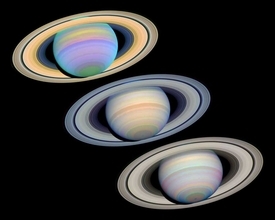 The images used to construct the false-color pictures were made through a combination of filters covering the electromagnetic spectrum from ultraviolet (top), to visible (middle) and infrared (bottom) wavelengths highlighting different features in the Saturnian atmospheric bands and rings. Well known for its bright ring system and large, mysterious moon Titan, gas giant Saturn is also a planet with a dynamic atmosphere and high-speed winds. In fact, in the 1980s, Voyager spacecraft measured equatorial winds of over 1,000 miles per hour. Giant storm systems, comparable in size to planet Earth itself, have been seen erupting in Saturn's cloud tops.